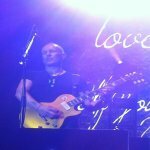 Def Leppard played a show at Meadowbrook in Gilford, NH last night and the setlist details are available. The band played a 17 song set with Slash and his band (featuring Myles Kennedy and The Conspirators) as support. The show started promptly at 9pm in 90 degree weather. 'Don't Shoot Shotgun' and 'Gods Of War' remained in the setlist with all songs being played for the first time in Gilford. The first show in the state of New Hampshire outside of Manchester which was played four times from 2003-2008. The final show of the Summer Tour 2013 takes place tomorrow night in Canandaigua, NY. This and all 17 full songs played for the first time in this city. Played for the first time in New Hampshire since the 25th June 2005 show in Manchester. Only the second US city this song has been played in since 1988 alongside Las Vegas in March/April. Played (in this form) for the first time together in New Hampshire since the 15th August 2003 show in Manchester.